I knew it was only a matter of time before I would get tired of looking at this mess. Yes, I did chop off 4 inches a little while ago but the rest was going to go sooner or later. Everyone will encounter some setbacks when growing out their hair. This has been my first real one. I have been fortunate enough that in the 4 years since I have began to really take care of my hair this is the first time that I have had to cut a significant amount of hair off due to some type of damage. I do regret getting on Mirena all the time, but since the damage that it has done to my hair and my body is already done there is no reason to keep dwelling on the issue. A fresh new start is just what I needed! This time I cut off about 6"! So I have gotten rid of 10" total in about 2 months. It is going to take me 2 years to get back to where I was before aug 2008. I may be trying some growth aids in between to boost my growth so I may get there a little quicker! These pics basically tell the story which made my decision. When a set of twists don't look good there is a problem!! My take on transitioning from relaxed to natural! !- How did you do it?? Transitioning for many can be a trying experience. For me though, the first time, it was a breeze. What did I do, you ask? Plain and simple. I did absolutely nothing to my hair. 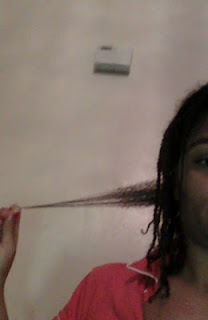 I kept a very simple regimen which consisted of weekly shampooing and deep conditioning. Most of the time I wore my hair in a simple ponytail. Now I know that a style like that is not really practical for everyone. But at the time I was in my first year of college I just had my daughter so I did not have the time to go all out with crazy hairstyles. Not that I was looking busted all the time, I did occasionally do a sew-in, a set of french braids or a braid out. Those are the only styles that I remember wearing at the time. When I began transitioning I began to use conditioner as a leave-in. I could not find (and still haven't today!) a good creamy leave-in that I love. I found that my hair needed something more than the usual things that many of the women I knew used in their hair. Everyone around me used grease, Lusters pink lotion, and other crap like that. Hell, I was still using Pantene pro-V shampoo! I began to experiment with new products and techniques such as cowashing and baggying. I have found a few product staples which I will list below. But I also found a few techniques which are essential to growing out my hair. Without these techniques there is no way that my hair would have reached the length that it did. As far as taking care of and growing out your hair I do not think that the products that you use have that much of an effect on the final outcome. You can use the cheapest products and still come out with the same results as using the higher end, more expensive products. Not to mention all the money you will save. In my opinion, its all about the technique. So this is kinda long overdue! I have been asked so many questions about transitioning I thought it was about time I posted about it. 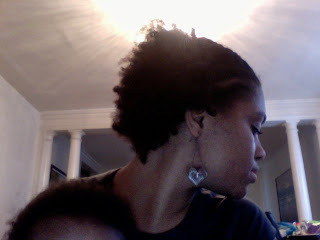 My natural hair journey began right after i had my first child. I was natural for most of my life because my mother refused to let me have any type of freedom with my hair. I gave myself my first relaxer when I was in 6th grade. I then began to experiment and teach myself all different types of hairstyles. By the time I was in high school I was doing styles for my friends also. I then became interested in growing out and caring for my hair. The first website I was able to find was Growafrohairlong.com. From this website I learned a lot of the basics in haircare. I later found LHCF and all the other hair forums. From here my hair took off. I reached APL by the time I graduated from HS. I had my protective styles and regimen down! I reached a little obstacle after I gave birth to my second child. I got on Birth control... I was on the depo but quit because of complications. I then began to use the ring. What does this have to do with transitioning?? This is where my journey began! Because of the BC I began to experience hair loss. Which I attributed to the use of relaxers. So I decided to stop all use. I transitioned for a year and then did the Big Chop! Pics of my BC can be found in my fotki album HERE.